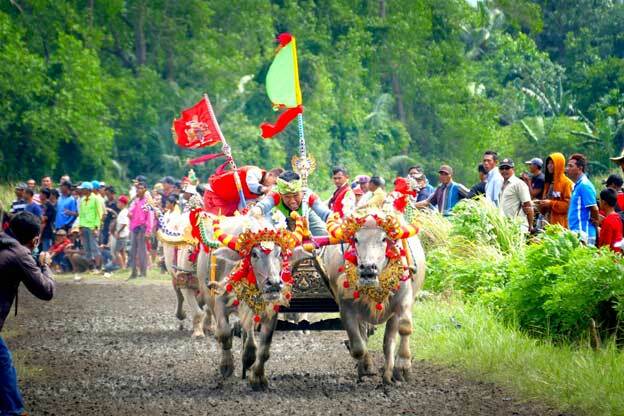 Makepung is the name of the main grand prix in Jembrana, West Bali, which features buffalo racing. Hundreds of pairs of buffs were joined together with their jockeys. They ride traditional wooden beams which are slightly modified for competition. The racer of buffaloes, or kerbau pepadu, compete in various open race circuits in assorted heats. These series of competitions are held around the district of Melaya. They lead up to the finals, known as the Jembrana Regent’s Cup and the Governor’s Cup. Makepung is derived from the base word of kepung, meaning ‘chase’, similar to the expression ‘steeplechase’. This race brings to life the agrarian way of life and effortlessly blends it with the island’s traditional cultures to create a modern day tourist attraction. This event also has a great effect on other important facets of the island’s economy including agriculture and farming. On the day of the finals, there will be a unique show known as the ‘buffalo fashion show’. During this show, this beautiful animals are dressed in animal clothing embellished with ornaments before been allowed to compete in the best-dressed section. Makepung Bullock Races run each year and kick off early, usually by 7.30am, so if you would like to attend, make your way to the circuit in good time. The dates for each year’s event vary, however the heats take place each month on a Sunday morning from from July to November. The final cup will be held on 18 November this year. If you are having a Bali Tour, it will be good to watch this spectacular race.